Home › Home › 5 Habits You Should Quit To Become A Better You! I am sure it is no longer news that I am a thinker – I think. I analyse. I reflect and I self-motivate. These are activities I believe have been ingrained into the fabric of who I am and how I make sense of my world. So whether it is a good or bad experience, I go back into my space and reflect about what has happened. I assess the implication of the experience for me, what lessons are to be learned and decide if it is an experience I would be open to again. In the same vein, I equally assess my behaviours and attitudes. Let me admit at the juncture that I am a Working-Progress and I am not embarrassed to proclaim that I too have my baggage. Yes, over the years, I have become an expert at concealing them with expensive or the not-so-expensive costumes of the modern world – clothes, shoes, make-up, perfumes, jewellery – as well as a confident exterior I display for people to see. But, even in the midst of all my shenanigans, it wouldn’t be smart of me if I do not face or tell myself the TRUTH (now and then) because only then can I conquer my demons and with time shed some of my baggage. So I recently decided to play a Truth game with me, myself and I tried to be brutal and honest with myself, my fears and the obstacles I believe are a constant barrier to me living my authentic self, thriving as a human being and becoming the better version of myself. In essence, having owned up to some of my baggage, I must confess it has been hard taking it all in one go. Hence, I am beginning to see the importance of taking baby steps in order to achieve my goals. Shedding a couple of habits here and a couple more there as a continue on this journey called Life. Here are five habits I am currently shedding and I feel these are habits you should consider quitting too especially if you are one of those people constantly seeking for new ways of becoming a better life and version yourself. Ok, this is one habit I have had to unlearn through the easy and hard way. I say this because I have had experiences where I thought I owed it a duty to please everybody in my life, whether they deserved it or not. Also, I misconstrued the Bible admonishing us to love our brothers as ourselves and do unto others what we want them to do to us as pleasing everybody. But experience has thought me that I cannot please everyone. Permit me to say it one more time, this time to you: You Cannot Please Everyone and your best attempt at pleasing everyone will also not get you very far. So in order to maintain your happiness, let your good and best intention stem from the need to fulfil that innate desire to be of good nature, kind and loving without expecting anything in return. I have come to realise that acts of kindness or goodness are often not reciprocated by the beneficiaries of the act. It is however reciprocated in ways you could never have imagined or conjured. I know we all love the easy, the comfortable, the familiar and the safe life. Change or a shift in the rhythm of our life can sometimes be very uncomfortable. Yes, I love adventure and I love to travel as long as I know that I get to come back home – to my space and the environment that I have grown accustomed to and maybe even love. So asking me to dive or jump into the unfamiliar terrain is not something I do with a big smile on my face especially when I know there is no ‘home’ to come back to or no ‘turning back’ once the decision has been made. While a part of me want to be a risk taker and live without fear and inhibition, yet there is my antagonist self second guessing this desire of mine. Someone recently asked me if I was a risker-taker. To this, I replied, ‘Well I take calculated risk’. This question made me think long and hard about the life we often desire and how the fear of change usually stands in the way of achieving this and consequently placing a limitation on our lives. I can totally relate to this because the only time I have made real advancement in my career has been times when I ventured into the unknown and the not-too-familiar. So I am devising a strategy where I always think of a positive story from the past to counter my antagonist-self that hates change. I recently participated in an Iceberg Exercise designed to help one uncover past experiences, hurt, pain and disappointments that are believed to have shaped an individual’s personality. While some psychologists believe that personalities are born, others are of the opinion that personalities are shaped or framed by human experiences (trust me, this is a topic for another day). The Iceberg Exercise supports the theory that 90% of our individual personality trait or character (what makes us who we are) is hidden behind the exterior we project to people just in the same way 90% of an Iceberg mass is hidden below sea level. Therefore, in order to project our authentic self, the exercise teaches the participants to remember key vulnerable experiences from their past, own their unique story (whether good or bad) and use their new understanding of themselves to set new standards – one that is in tandem with their values. This exercise thought me how to really dig deep into my childhood experiences. I was shocked to realise that the person I am becoming today has been influenced (to an extent) by my past experiences spanning over three decades. While the positive experiences can make you strong and develop your character, negatives experiences can become a cancerous cell that overshadows and hinders your journey into becoming your true authentic self. After completing this exercise, I realised I still had some unresolved childhood issues that are negatively impacting my desire of owning my story and living my truth. Hence the past has to go! If you belong to the category of the organiser, the analyser with the slightest trait of perfectionism, then you may likely find yourself very often in this situation. On days when things are going well, you feel there is more you should be giving or think you are getting too comfortable. When things are going pear-shaped, you bring the hammer down on yourself thinking you have messed it all up. You end up taking more than your own share of the blame as if that would make things better. I have realised that being hard on myself is exhausting and often takes away the sheer joy of doing and living in the present. Hence, the more time I spend being too hard on myself, the less time I have appreciating other areas of my life that are going really well. One way I am countering this habit is to acknowledge my strengths and weaknesses and accept that it is OK to not be a well-rounded individual. For instance, I tell myself that it is Ok if I am not a great editor or proofreader and I’m considering getting an editor to proofread and edit my work. At least that way, if I see a mistake in what I write, bringing the hammer down on the editor (lol) rather than myself will take the unnecessary stress off me. I have also heard in recent times that it pays more to focus more on one’s strengths rather than weaknesses because focusing on strengths will yield greater results as opposed to focusing on the latter. I am still chewing on this… But in the meantime, I constantly try to remind myself that: ‘I am good enough and I am doing my possible best at every point in time’. This is one habit I am fighting to get rid of with every blood, sweat, breath and fight that I have in me. I know it so well and I have watched the script play over and over in my career, relationships and projects. I start with very good intentions but within the blink of an eye, I find myself analysing and overthinking situations, scenarios, comments, events and ideas I had thought were great, out-of-the-box or just a breath of fresh air at the time of conception. With a bit of courage, I have tried to poke and probe into this pattern of mine and I found that nothing good ever comes out of me overthinking and overanalysing. This is because I am prone to looking for a million reasons why something will not work out, why it is a bad idea or why a relationship is doomed even before it begins. On occasions where I resisted the urge or acted in spite of me overthinking and overanalysing and it did work out, I am quick to remind myself that the success is a fluke and caution myself not to expect the same positive or happy ending next time. Hence I have come to terms with these habits of mine and made up my mind that I need to quit this habit, just like the other four above, because overthinking and overanalysing are nothing but a buzz kill. Are there unhealthy habits you too would like to quit or you are working towards quitting? Please go ahead and share, would love to hear from you. 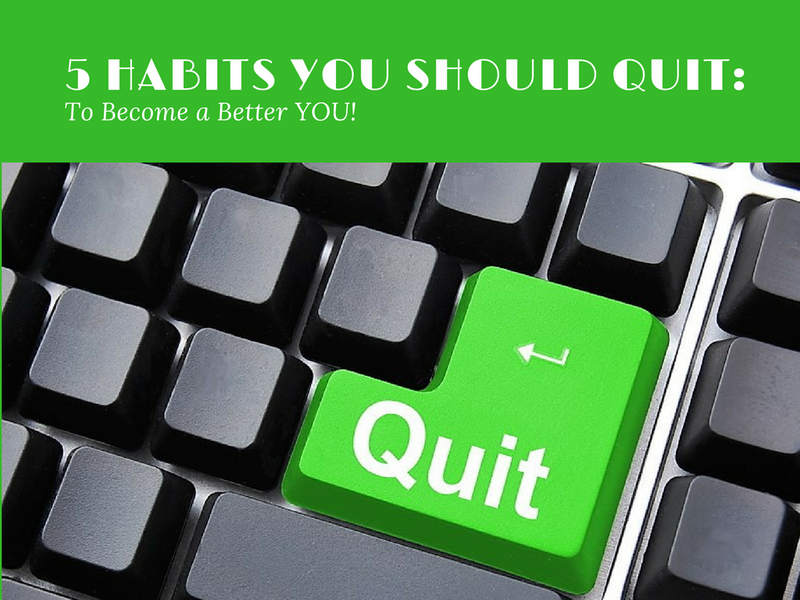 I loved reading about the 5 bad habits to quit…I can relate to all of them, with a special emphasis on #1. Imagine that, right!? Anyway, after reading your blog I’ve renewed my quest to not people please anymore. Wish me luck!